Stress is defined as a response to a demand that is placed upon you. Stress in a normal reaction when your brain recognizes a threat. When the threat is perceived, your body releases hormones that activate your “fight or flight” response. This fight or flight response is not limited to perceiving a threat, but in less severe cases, is triggered when we encounter unexpected events. Psychologist Richard S. Lazarus best described stress as “a condition or feeling that a person experiences when they perceive that the demands exceed the personal and social resources the individual is able to mobilize.” For most people, stress is a negative experience. Stress may cause you to have physiological, behavioral or even psychological effects. Physiological – hormone release triggers your fight or flight response. These hormones help you to either fight harder or run faster. They increase heart rate, blood pressure, and sweating. Stress has been tied to heart disease. Because of the increase in heart rate and blood pressure, prolonged stress increases the tension that is put on the arteries. It also affects your immune system which is why cold and flu illness usually show up during exams. Behavioral – it may cause you to be jumpy, excitable, or even irritable. The effects of stress may cause some people to drink or smoke heavily, neglect exercise or proper nutrition, or overuse either the television or the computer. Psychological – the response to stress may decrease your ability to work or interact effectively with other people, and be less able to make good decisions. Stress has also been known to play a part in anxiety and depression. Academics – by far the biggest stressor for college students: the pressure of not failing. Dating – relationship problems may add to the pressure/stress of academics. Environment – certain environments can bring about stress such as discussing/viewing heated topics, slow moving traffic, trying to find a parking spot, etc. Extracurricular – some students may feel pressured to make extracurricular activities a part of their daily routine to the point where every hour of the day is accounted for. Peers – peer pressure is a major stressor, especially pressure that is negatively influenced. Time Management – one of the biggest stressors is not knowing how to plan and execute daily activities such as class, work, study time, extracurricular activities, and time alone. Money – some student find themselves thinking more about money than they do anything else. Money is a huge stressor that college students face. Parents – yes, even parents can become stressors. Pressure from parents to succeed is a great stressor. 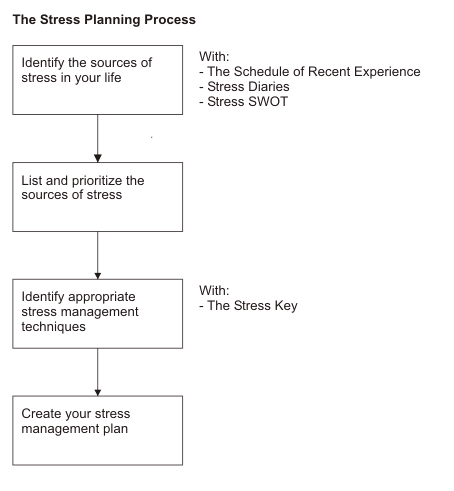 Starting a stress journal may help you identify what your stressors are. Keeping a daily log of what caused your stress, how you felt (physically and emotionally), how you reacted and how you managed to get over it/make the situation better, may help you. This diagram can help you with your stress journal. Learn how to say “NO!” – know your limits and do not compromise them. Taking on more than you can handle is not a good choice. It is ok if you don't do every single activity that your club, fraternity, sorority or your friends are doing. Attitude – it is human nature to want to freak out. Your mind is a powerful tool; use it in your favor. Thinking rationally can take you a long way. Laugh – Do something that you enjoy, take on a hobby, hang out with friends, and learn to balance your life. If you are feeling upset, express your feelings. Don't keep them to yourself because that will only add to your stress. Avoid alcohol and cigarettes – this is just a quick fix. Once the chemical leave your body, you are back to feeling stressed and you are probably worse off than when you started. Healthy eating – get the proper nutrition. Eat at least one hot-home cooked meal a day. Exercise – physical activities can help you in not only burning off calories, but burning off stress. Exercise helps release tension. Exercise for 30 minutes a day for at least 3 times per week. Relaxing your mind and body – take deep breaths. Visualize success. Set some “alone time” where you do something you enjoy. Practice “mindfulness”, focusing your attention on the present moment. Sleep – at least 7 hours of sleep are needed in order for your brain and body to function at optimum level. Avoid taking naps for more than 1 hour. Healthy relationships – talk and hang out with friends. Find some you relate to and with whom you can share your problems with. Time management – get a planner, create a schedule, or even a to-do list. Map out what your quarter will look like. Once you have done that, do a schedule for each week. Then create a schedule for each day. Be specific. Mark down your class meeting times, study time for a specific subject, mealtimes, fun activities, and sleep. Organization – learn how to organize your notes, keep track of your assignments and note important due dates or date of exams. Establish your priorities for the day. Spirituality – spiritually is regarded as finding meaning in your life, the ability to connect with others. Determine your learning style – find out whether you are a visual, auditory or kinesthetic learner. Slow Down – take a deep breath and know your limits. Take your time so that you can ensure a well done job. Find a support system – whether it's your mom, sister, brother, friend or counselor, find someone you feel comfortable sharing your feelings with. Sometimes all we need is to vent off the frustration. Make changes in your surroundings – if you find it difficult to study in your dorm try moving to a place where there is no loud music, and brighter lights. Delegate responsibilities – when school or work becomes overwhelming, dividing up the work or responsibilities helps alleviate pressure and stress. Cal Poly's Counseling Services offers counseling to individuals, couples, and groups. Counseling Services offers help and guidance in stress management and many other related topics to help you gain control and manage your life here at Cal Poly. Call 805-756-2511. Georgia Southern University has an excellent online workshop on stress management. Davis, Martha and Robbins, Elizabeth. Eshelman, and Matthew McKay. The Relaxation & Stress Reduction Workbook. 5th edition. Oakland, CA: New Harbinger Publications, 2000.